The PARMA.2F outdoor garden furniture set with a lovely roses-themed design is made by cast aluminum. This garden set makes an elegant style to your garden, patio, yard or any outdoor space. The table has a hole to accommodates a umbrella to provide shade during daylight hours. 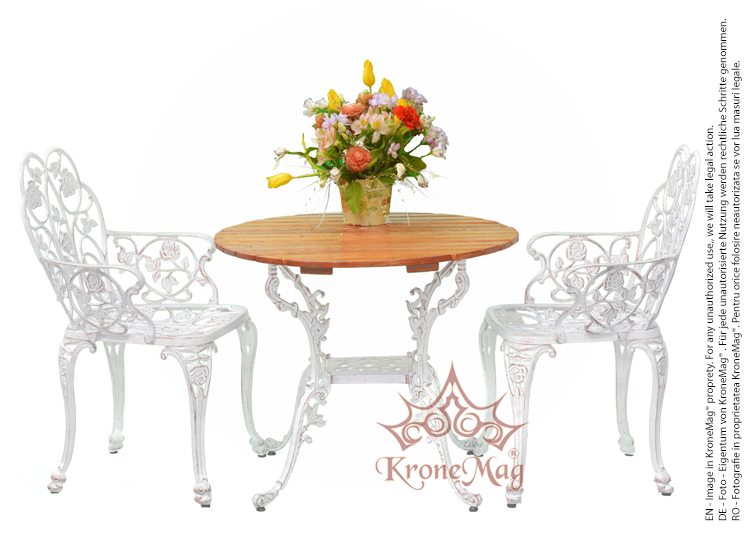 The garden furniture set is painted with special paint for outdoor. On your request, the garden furniture set can be antiqued with gold, silver, copper and green. The preservation of beech wood elements of the garden bench and garden table is assured by wood impregnation and after that with coating varnish. This method gives a higher resistance over time. Aluminum Outdoor Bistro Set MESSOLD 4FThe MESSOLD Outdoor Bistro Set is integrally made of aluminum ..